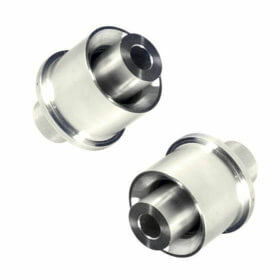 Front Wishbone (Lower Control Arm) Bushings Aluminum – Spherical Bearings for BMW E82, E90, E92. The factory rubber bushings deflect allowing geometry / alignment changes under load. These aluminum front lower control arm bushings with spherical bearings eliminate this movement that these cars are prone to by holding the front suspension geometry in place for precise handling and steering feedback. Set of two. Made of solid 6061- T6 aluminum and precision CNC’d for a perfect fit. The CNC’d aluminum spacers allow proper rotation of the high-quality, Teflon-lined race-spec bearings when installed.